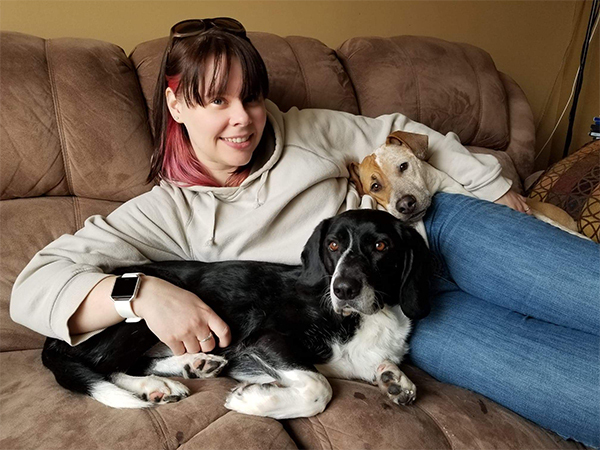 Stasia Gaffney was at her home in Orleans watching the storm on the Friday when six tornadoes hit the Ottawa-Gatineau region. But it wasn’t until the next morning that she realized the extent of the damage. Among the many devastating pictures on her social media feed were photographs of the west-end dog park at Bruce Pit – and the ruins of what used to be the dog memorial there. She felt crushed. The memorial had once adorned a fence on the south path of the park. It consisted of more than 200 dog tags and plaques commemorating pets that had died over the years. The memorial was destroyed by the storms, along with two hectares of trees in Bruce Pit. 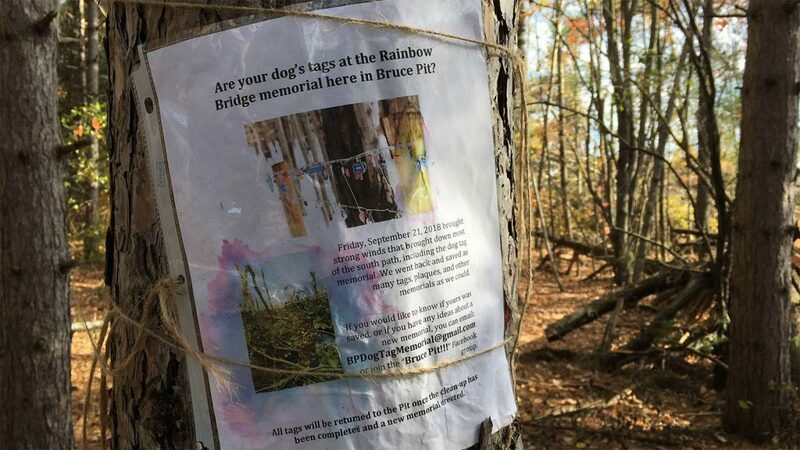 So, encouraged by other dog owners on Facebook, Gaffney and her boyfriend went to Bruce Pit, and through mud and fallen trees, they collected more than 100 tags. It was the beginning of what Gaffney hopes will one day be a new memorial for people’s beloved dogs. 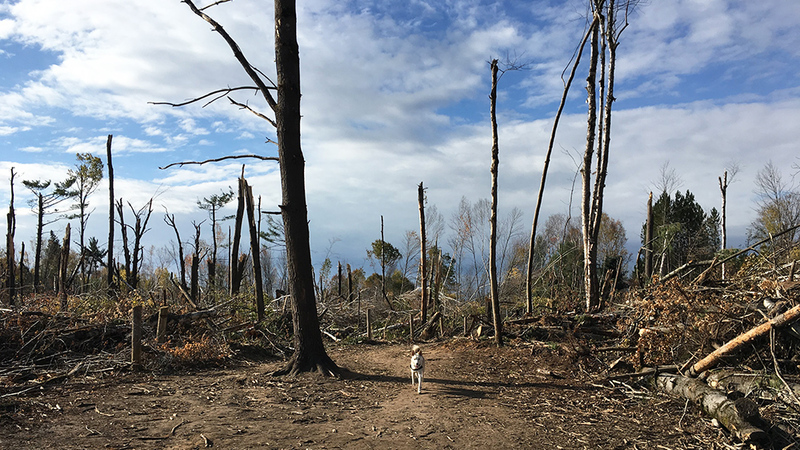 Collecting the tags was her way of easing people’s minds about their pet memorial, and making sure no one else had to risk their own safety by climbing through the downed trees. Before it was destroyed, the memorial was a public display of people’s grief in losing a family member. A common practice for dog owners was to rub their dog’s tag every time they walked by. Dominique Huras, strategic communications adviser of the National Capital Commission (NCC), said the memorial was built unofficially over time by the community, without NCC approval. 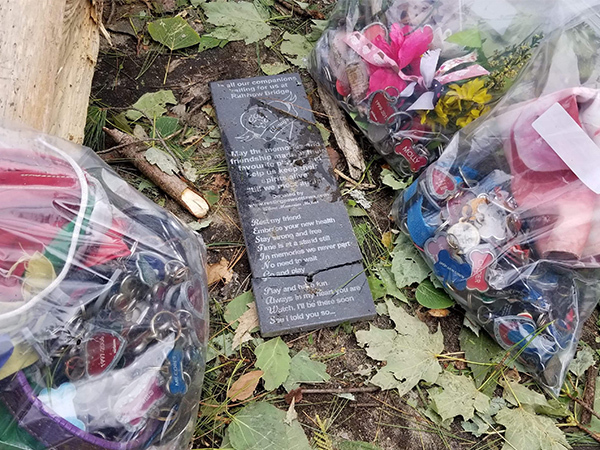 NCC workers have collected the rest of the dog tags, however, and these will be put back in the same area when the fence is repaired. There’s no date for that yet. The NCC’s clean-up work in the Bruce Pit area is expected to continue over several weeks. Restoration, including replanting of trees destroyed by the storm, will follow. Officially, the area remains closed to the public because of continued safety concerns. Closures include sections of a nearby trail, sections of the Greenbelt close to Bruce Pit, and sections in the off-leash part of Bruce Pit. But dog owners have been using the damaged part of the dog park, according to a survey by Capital Current. 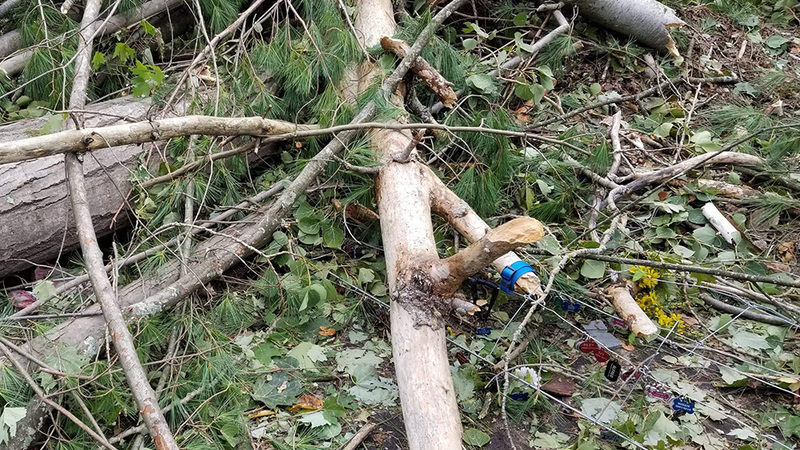 The survey asked members of the Bruce Pit community Facebook group to answer seven questions about their experience with the tornado damage to the dog park. 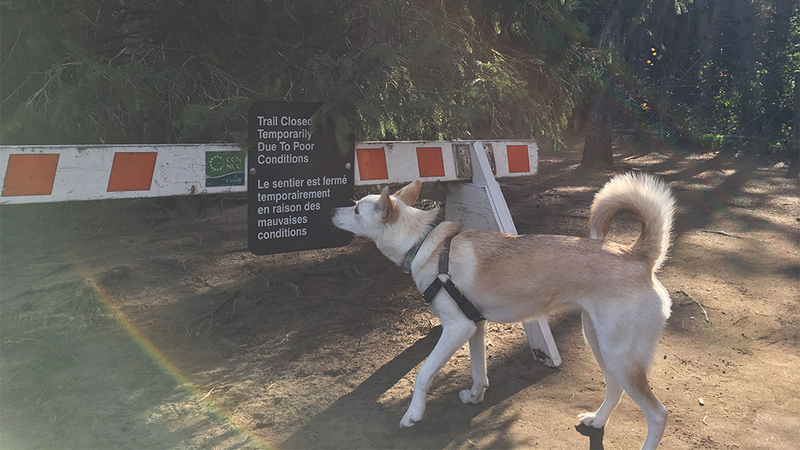 Seventy-three per cent of those who responded said they were using the entire park despite the restrictions, and when asked why, the dog owners provided answers such as: it’s habit; “to marvel at the incredible power of nature;” they trust their dogs to stick to the trail or simply, curiosity. Others have avoided it, however. 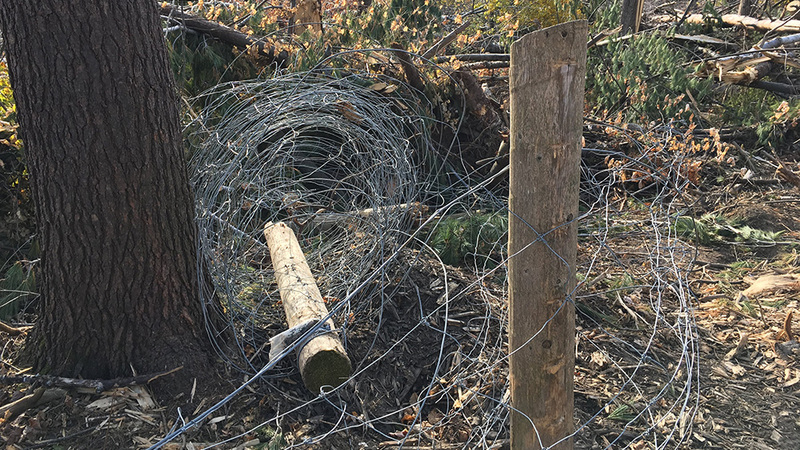 One dog was injured by the fence that now lies twisted in the mud, and respondents say they are concerned for their dogs’ safety because of the fence and the fallen trees. 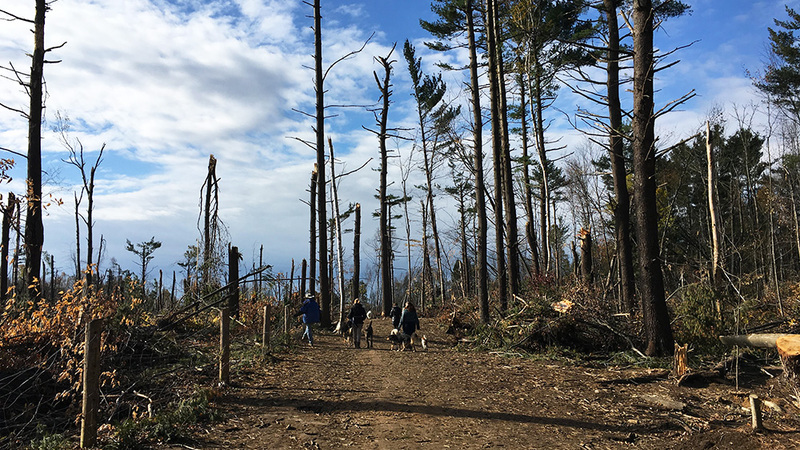 Those surveyed said their hopes include: “Restore the damaged area so that it’s safe again”; “regrowth of the trees”; and letting nature regenerate itself. Desire for regrowth extends beyond Bruce Pit to the Arlington Woods community. 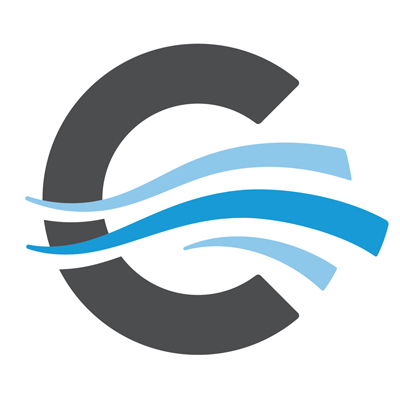 The Trend Arlington Community Association will soon be speaking with the NCC about rebuilding the area. The community hopes to participate in the replanting of trees, although association president Sean Devine acknowledges they have no jurisdiction over the land. The exact timeline for restoration is not yet known.